Apart from the five prototypes built for the US Army, Hughes built four others for its own research purposes, one of which was converted into a civil version designated Model 500, which flew at the beginning of 1967. The subsequent Model 500C variant had a 405shp Allison 250-C20 turbine. One OH-6A was later modified under a research programme for ARPA (the advanced research office of the US Department of Defense) to reduce noise levels and has been nicknamed "The Quiet One". It introduced a five-blade main rotor, four-blade anti-torque rotor, exhaust silencer and various noise blanketing devices on the air intakes. The new rotor has 67% of the r.p.m. of the original one, allowing 270kg more payload to be carried at a maximum speed of 278km/h. A second experimental prototype, the OH-6C, with an Allison 250-C20 turbine, reached a speed of 322km/h during a test flight from Edwards Air Force Base. 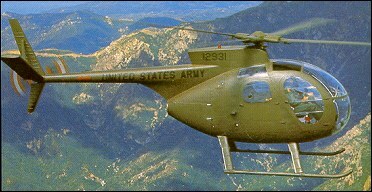 In March 1960, the US Army announced a design competition for a lightweight observation helicopter (LOH) to replace two rotary-wing aircraft, the Bell H-13 Sioux and the Hiller H-23 Raven, and a fixed-wing aircraft, the Cessna L-19 Bird Dog. Missions specified for this LOH were visual observation and target acquisition, reconnaissance, command control, and utility tasks at company level. In addition, the Request for Proposals for the LOH stated the following qualitative needs: 'Attention is specifically drawn to the paramount desires of the US Army for a Small, Light Weight, Inexpensive, Reliable, and Easily Maintainable vehicle most nearly capable of fulfilling the technical requirements of Type-Specification TS-153.' Notably, TS-153 called for a payload of at least 181kg in addition to the pilot, a cruising speed of 204km/h, an endurance of 3 hours, a hover ceiling out-of-ground effect of 1,830m with ambient temperature of 35�C, and a dynamic component minimum life of 1,200 hr. Although these requirements were demanding, 12 firms submitted no fewer than 22 proposals as potential orders were expected to be quite substantial. Among manufacturers expressing the greatest interest in this competion was Hughes Tool Company which assigned responsibility for the design and development of the Model 369 to a team led by Malcolm Harned. Convinced that minimum size was all important for the LOH success, the Hughes team aimed its preliminary design studies at determining the minimum possible rotor diameter which could accomplish the mission. They concluded that by minimizing the empty weight and using a four-bladed configuration it would be feasible to use the 7.62m diameter rotor blades of the Model 269A which were in production at a very low cost. Later on, the diameter of the main rotor was increased to 8.03m and Hughes adopted a novel strap retention system for the blades to eliminate the conventional flapping and, feathering bearings. The team then endeavoured to select a fuselage configuration offering an absolute minimum of parasite drag while providing accommodation for a pilot and five fully-armed troops (four of whom sat on the floor in a cramped compartment between the pilot and the diagonally-mounted Allison T63 turboshaft) and adopted the characteristic teardrop-shaped fuselage of the Model 369. Finally, project engineers minimized structural weight by selecting a one-piece tail rotor drive shaft and adopting a simple manual flight control system. Lacking engineering and flight test personnel experienced in aircraft evaluation procedures, the Army requested assistance from the Navy in running the LOH competition. Thus, it was a joint Army-Navy team which selected Bell and Hiller as winners of the design competition in May 1961. Fortunately for Hughes, the Army and Navy evaluators almost immediately added the Culver City firm to the list of those manufacturers requested to build five prototypes each for competitive evaluation. Initially given HO designations, the new observation helicopters received OH designators before being flown, as the Department of Defense established a new system of aircraft designation in September 1962. The Bell YOH-4A first flew on 8 December, 1962, the Hiller YOH-5A on 26 January, 1963, and the Hughes YOH-6A on 27 February, 1963. When first flown by James Vittitoe at Culver City, the YOH-6A was temporarily registered N9696F. It then had a broad, upward-canted stabilizer on the starboard side and a fairly large tail boom of flapped aerofoil cross section. However, with this boom design, sideward flight was only feasible at speeds of not more than 8km/h while the stabilizer created both dynamic and static stability problems. Accordingly, before the YOH-6As could be turned over for evaluation by the Army-Navy team, Hughes tested a large number of tail configurations before adopting one characterized by a slimmer tail boom of circular cross section and narrower stabilizer braced to a vertical fin. With this new boom and stabilizer, the YOH-6A exceeded the control margin required by military specifications under all flying conditions. At the end of the seven-month evaluation, during which prototypes from the three competitors were put through comprehensive field and performance tests at Fort Rucker, Alabama, Fort Benning, Georgia, and Fort Ord and Edwards AFB, California, the Design Selection Board determined that the Bell YOH-4A did not meet the specified requirements, that the Hiller YOH-5A met the requirements on the basis of minimum acceptability, and that the Hughes YOH-6A exceeded the minimum requirements in mission capability, speed, economy of operation, and ease of maintenance. As the bid submitted by Hughes was also lower than that by Hiller, the YOH-6A was declared the winner on 26 May, 1965. Soon thereafter, Hughes received a multi-year production contract for 1,071 OH-6As and, in keeping with the Army's tradition of naming its aircraft after Indian tribes, the new helicopter was named Cayuse after a tribe from Oregon. Fully satisfied with the performance, handling characteristics, and maintainability of the OH-6A, the Army intended to continue ordering the Hughes light observation helicopter to meet its entire LOH requirements. However, either as the result of a deliberate under pricing of the initial batch of Cayuses or of the rapid manufacturing cost escalation experienced by all contractors during the Vietnam War industrial buildup, Hughes increased substantially the OH-6 unit cost thus prompting the Army to reopen the LOH competition in 1967. By then Hiller was no longer in business, but Bell entered a much redesigned version of its original entry and succeeded in displacing Hughes as the main supplier of LOHs. Only 349 additional OH-6As were ordered from Hughes, while contracts for 2,200 OH-58As were awarded to Bell. Fortunately for the California manufacturer, the civil version of its light turboshaft-powered helicopter, the Model 500 which had been announced on 21 April, 1965, 35 days before the YOH-6A was chosen as the winner of the original LOH competion, had become a popular seller. It was to put Hughes among the world's leading manufacturers of helicopters and, as the MD 520 and MD 530 series, was destined to remain in production during most of the 'nineties and possibly into the next millenium. YOH-6A (YHO-6): Five YHO-6s (62-4212/62-4216) were ordered in 1961 for competitive evaluation as part of the Army LOH programme and a sixth (62-12624) was acquired shortly afterwards. Redesignated YOH-6As before the first flight on 27 February, 1963, these pre-production vehicles were each powered by a 317shp Allison T63-A-5A turboshaft engine derated to 252.5shp for take-off and 214.5shp maximum continuous rating and driving a four-bladed main rotor and two-bladed tail rotor. Side-by-side accommodation was provided in the front cabin for a crew of two and space was provided in the rear compartment for two folding seats or cargo. With the rear seats folded, four fully-armed troops could sit on the floor. The first YOH-6A (62-4212) was transferred to the USAF in March 1969. OH-6A: In all, 1,420 OH-6As were built by Hughes, including 1,417 ordered under the main contracts (65-12916/65-13003, 66-7775/66-7942, 66-14376/66-14419, 66-17750/66-17833, 67-16000/67-16686, 68-17140/ 68-17369, and 69-15960/69-16075) and three ordered as replacements (66-17905, 66-17918, and one unidentified). Essentially similar to the fully modified YOH-6A with the smaller tail boom and revised stabilizer, the OH-6A was built in three configurations: 505 were completed in Series I, 569 in Series II, and 340 in Series III with the use of slightly different parts (including the addition of an air inlet filter), electronics, and avionics (including the notable addition of the LOHAP Light Observation Helicopter Avionics Package) differentiating the series. The Cayuse, when armed, normally carried either a XM27E1 7.62mm machine-gun kit or a XM75 40mm grenade launcher on the port side of the fuselage. A flexible gun could be mounted on the aft door on the starboard side. Over the years, OH-6As have been bailed back to the manufacturer for use in a variety of experimental programmes including one to achieve significant reduction in noise level, one to evaluate a higher harmonic control (HHC) system for helicopter vibration suppression, and one to develop a No Tail Rotor (NOTAR) system. For the noise reduction programme funded in 1969 by the Army and the Advanced Research Projects Agency, aircraft 65-12968 was fitted with a five-bladed main rotor, a four-bladed tail rotor, a shrouded engine inlet, and an engine exhaust muffler. By operating at reduced rotor-tip speeds, as much as 20 decibels in noise reduction was achieved, thus leading to the nickname 'The Quiet One' to be painted on the rear fuselage sides for publicity purposes. For the HHC research programme funded by Hughes, the Army, and NASA, an OH-6A (68-17230) was fitted with a computer-controlled vibration suppression system and high frequency hydraulic actuators to superimpose high frequency feathering on the normal rotor blade feathering motion. The modified aircraft was first flown at the US Army Proving Ground in Yuma, Arizona, on 25 August, 1982, and was evaluated by the manufacturer, the Army's Research and Technology Laboratories, and the NASA Langley Research Center. In the mid-seventies, company-funded efforts were initiated by Hughes to develop an anti-torque tail boom to dispense of the use of a conventional tail rotor. Flight testing of an externally mounted fan to provide circulation control air and measure the reduction in conventional tail rotor thrust requirement was undertaken in 1977-78 and led to the award in September 1980 of a NOTAR research contract funded by the US Army Applied Technology Laboratory and the Defense Advanced Research Projects Agency. The NOTAR prototype (65-12917) was first flown on 17 December, 1981. It has been modified several times since then, notably in being fitted with an MD 500E forward fuselage and re-engined with a 420shp Allison 250-C20B turboshaft in 1985, and has enabled McDonnell Douglas Helicopters to develop an advanced NOTAR system for use in the MD 520N, MD 530N, the new MDX for the civil market, and the LHX scout for the Army. EH-6B: This designation identifies four OH-6As (68-17301, 68-17538, 69-15977, and 69-16018) which were modifed in 1982 for SIGINT (Signal Intelligence) and other electronic surveillance activities in support of Special Forces. At that time, they were re-engined with a military version of the 400 shp Allison 250-C20 turboshaft and fitted with the 'Black Hole' infrared suppression system on the engine exhaust. Two were later brought up to MH-6B standards and one became an AH-6C. MH-6B: Twenty-three OH-6As (68-17140, 68-17155, 68-17167/ 68-17168, 68-17175, 68-17193, 68-17225, 68-17256, 68-17290, 68-17316, 68-17320, 68-17332, 68-17334, 68-17341, 68-17346, 68-17348, 69-16015, 69-16052/69-16054, 69-16057, 69-16062, and 69-16072) and two EH-6Bs (68-17358 and 69-15977) were modified as multi-mission (scout and light attack) helicopters for assignment to the Army's Special Forces. Modifications included (1) re-engining with 400shp engine with 'Black Hole' infrared suppression exhaust system; (2) revising the cockpit lighting for operations with night vision goggles (NVGs); (3) fitting a turret-mounted FLIR sensor; and (4) installing a tubular mount through the lower aft fuselage to carry externally either two 7.62mm miniguns or four troop seats. Three were later modified as AH-6Cs. OH-6B: First used in the mid-sixties to identify a proposed development which remained on the drawing board, the OH-6B designation was given in 1988 to OH-6As which were to be rebuilt and modernized in the Mississippi Army National Guard's Aviation Classification and Repair Activity Depot (AVCRAD) at Gulf port, Mississippi. As part of the modernization programme, 250 OH-6Bs are being (1) brought to a common Series IV standard to improve their maintainability and increase their capability; (2) re-engined with the 420shp Allison T63-A-720 engine with the 'Black Hole' system on the engine exhaust; and (3) fitted with wire strike protection, adjustable landing light, and modernized avionics (including FLIR sensor). The first of three OH-6B prototypes was flown at Gulfport in May 1988 and was assigned to the Maryland ArNG for operational evaluation. AH-6C: A total of fifteen light attack helicopters is believed to have been obtained for the Special Forces by modifying eleven OH-6As (68-17191, 68-17228, 68-17242, 68-17249, 68-17258, 68-17276, 68-17298, 68-17307, 69-15973, 69-16031, and 69-16058), one EH-6B (69-160180), and three MH-6Bs (69-16052/69-16054) to a common standard with NVG-compatible cockpit, 400-shp engine with 'Black Hole' exhaust system, and provision for carrying either two minigun pods, two or four rocket pods (each with 19 Hydra-70 70mm FFARs), or four Hughes BGM-71 TOW (Tube-launched, Optically-tracked, Wire-guided) antitank missiles. OH-6D: This designation was given to the improved Cayuse version which Hughes entered in the Army's Advanced Scout Helicopter (ASH) competition. The ASH programme was not funded and, in its place, the Army decided to have Bell OH-58As brought up to the OH-58D AHIP (Army Helicopter Improvement Program) configuration. The OH-6D designation was next used to identify Kawasaki-built Model 500Ds in service with the Japanese Ground Self-Defence Force and Japanese Maritime Self-Defence Force. EH-6E: This designation identifies three Model 500Ds (81-23654/81-23656) procured by the US Army under a covert budget (a so-called 'black program') for electronic surveillance operations with the Special Forces. Like subsequent versions ordered for the Special Forces, this version is characterized by its five-blade main rotor, quiet four-blade tail rotor, mufflers, infrared suppression exhaust system, and advanced avionics. MH-6E: Based on the 500MD Quiet Advanced Scout Defender developed by Hughes from the civil Model 500D, this multi-mission version was procured for the Special Forces under a covert budget. Fifteen MH-6Es (81-23629/81-23637 and 81-23648/81-23653) were built by Hughes and another was obtained by modifying an EH-6E (81-23655). AH-6F: This designation identifies nine light attack helicopters (84-24319, 84-24677, 84-24681, 84-24683/84-24684, and 85-25347/85-25250) built for the Army's Special Forces and a similar machine (86-0141) acquired by the Air Force for evaluation by its Special Forces at Hurlburt Field, Florida. The AH-6F combines the airframe, engine, and rotor configuration of the MH-6E with the armament of the AH-6C and is fitted with a mast-mounted sight. As an alternative to miniguns, rocket pods, and TOW missiles, the AH-6Fs can carry a 30mm M230 Chain Gun (the Hughes-developed anti-armour cannon carried under the fuselage of AH-64s) or two Stinger air-to-air missiles on each side of the fuselage. AH-6G: This version corresponds to the civil Model 530 and differs from the preceding model in being powered by an uprated engine. Five AH-6Gs were built by Hughes/MDHC (84-24678/84-24680, 84-24682, and 85-25346) and seven were obtained by re-engining AH-6Fs (84-24319, 84-24677, 84-24681, 84-24683/84-24684, and 85-25347/ 85-25248). MH-6H: Twelve MH-6Es (81-23629/81-23634 and 81-23648/ 81-23653) and two EH-6Es (81-23654 and 81-23656) have been retrofitted with uprated engine and redesignated MH-6Hs. OH-6J: This designation is used to identify the Kawasaki-built Model 500Ms of the Japanese Ground Self-Defence Force and Japanese Maritime Self-Defence Force. Model 500: Powered by a 317shp Allison 250-C18A turboshaft (civil version of the T63-A-5 A) derated to 278shp for take-off, the commercial counterpart of the OH-6A was developed under the engineering designation of Model 369A and marketed as the Model 500. First flown on 13 September, 1966, it differed from the military variant in having non self-sealing fuel tanks with capacity increased from 231 to 240 litres and in being fitted with commercial avionics. Accommodation was provided for a pilot and four passengers in the executive configuration and for a pilot and six passengers or loads of up to 776kg in the Model 500U utility version. Intended for single-pilot operations, the Model 500 could be fitted with dual controls as an option. The standard skids could either be supplemented by inflatable floats for use during extended overwater operations from shore bases or by inflated floats for occasional use from water. Taller skids were available to provide added clearance when carrying external loads. In addition to being built by Hughes, Model 500s and 500Us were produced under licence by BredaNardi in Italy, Kawasaki in Japan, and RACA (Representaciones Aero Commerciales Argentinas SA) in Argentina. Hughes also produced two Model 500 versions for foreign military customers, the Model 500M for use in the observation, training, and utility roles, and the Model 500M/ASW for anti-submarine operations with the Spanish Navy. The Model 500M/ASW was fitted with an AN/ ASQ-81 towed magnetic anomaly detector (MAD bird) on the starboard fuselage side and taller skids providing clearance for the carriage of one or two Mk.44 or Mk.46 lightweight torpedoes beneath the fuselage. Model 500C: First flown on 23 February, 1970, this civil version differed from the Model 500 in being powered by a 400shp Allison 250-C20 turboshaft derated to 278shp for take-off and offering an ample reserve of power for improved hot-day/high-altitude performance. The Model 500C could be fitted with Chadwick fire suppression equipment consisting of a water/chemical tank in the fuselage aft of the pilot, spray booms on the fuselage sides, and nozzles on forward projecting booms. For medical evacuation, two stretchers could be accommodated crosswise in the aft compartment with bubble windows being fitted in place of the aft doors. An aft-facing seat for a medical attendant replaced the forward-facing passenger/co-pilot seat. Model 500D: This version was preceded by a modified Model 500 which, fitted with a five-bladed main rotor of slightly increased diameter (8.08 versus 8.03m) and a T-tail with small end plates to improve stability, was tested beginning in August 1974. The first Model 500D was flown on 9 October, 1975, and deliveries started at the end of 1976. Power was provided by a 420shp Allison 250-C20B engine derated to 375shp for take-off and fitted with an exhaust muffler. A small 'coolie hat' fairing was added above the rotor to smooth airflow over the tail surfaces. In addition to being produced by Hughes as the Model 500D and by MDHC as the MD 500D, this version has been licence-built by BredaNardi in Italy, Kawasaki in Japan, Korean Air in Korea, and RACA in Argentina. The Model 500MD Defender was developed for foreign customers and was offered with different armament and electronic equipment for operations in a variety of military roles. The basic Model 500MD Defender was an unarmed version for use in the observation, utility, and/ or training roles. The 500MD Scout Defender and 500MD Quiet Advanced Scout Defender (with the latter differing from the Scout Defender in having a Hughes MMS mast-mounted sight, a four-bladed tail rotor, and sound reduction modifications) were armed with either a 7.62mm gun pod, a 30mm Chain Gun cannon, a 40-mm grenade launcher, or 70mm rocket pods. The 500MD/TOW Defender (with a stabilised telescopic sight protruding on the port side of the nose) and the 500MD/MMS-TOW Defender (with mast-mounted sight in lieu of the nose-mounted sight) were optimized for the anti-armour role for which they were armed with four TOW missiles in pods on both sides of the fuselage. The 500MD/ASW Defender was developed as an anti-submarine warfare version with features from the earlier Model 500M/ASW supplemented by the installation of a radar on the port side of the nose. Finally, the 500MD Defender II, which was offered as a multi-mission version combining features of the Advanced Scout and MMS-TOW Defender versions, was fitted with a FLIR night vision system. As an alternative to TOW missiles, the Defender II could carry a 30mm Chain Gun cannon or two Stinger air-to-air missiles on each side of the fuselage. Optionally, all Defender versions could be fitted with an infrared suppression system. MD 500E (Model 500E): First flown on 28 January, 1982, the Model 500E differed from the 500D in having a longer and more streamlined nose and enlarged endplate fins. Powerplant installation and accommodation remained unchanged but passenger comfort was increased as the revised cabin offered more legroom and headroom. Standard MD 500Es retained the five-bladed, fully articulated main rotor of MD 500Ds, but an experimental MD 500E became the first MDHC helicopter fitted with an all-composite hingeless rotor. It was first flown at Mesa, Arizona, on 23 April, 1985. MD 500E licence production has been undertaken by BredaNardi and Korean Air. During the summer of 1989, NASA Langley Research Center's Acoustics Division flew a specially instrumented MD 500E for measuring engine and rotor noise. Preliminary test results indicated that a 5dB noise reduction could be achieved through the use of variable-speed main and tail rotors. In addition to MD 500MG Defender versions using MD 500E airframes and corresponding to Defender versions of the MD 500D, MDHC has developed the Paramilitary MG Defender and the FLIR-equipped Nightfox for police, border patrol, and anti-drug smuggling operations. The Nightfox, Paramilitary MG Defender, and all MD 500MG Defender versions can be powered by either the 250-C20B turboshaft of the MD 500E or the 250-C30 of the MD 530F. MD 520L: This version, which was introduced in 1989, differed from the MD 520E in being fitted with a five-bladed main rotor with a diameter of 8.66m, a four-bladed tail rotor of 1.45m diameter, and a 14cm longer tail boom. Power is provided by the Allison 250-C20R turboshaft derated to 375shp. MD 520N: This version, which had not flown by the end of 1989, will differ from the NOTAR-equipped MD 530N in being powered by the Allison 250-C20R derated to 375shp. Customer deliveries are to start in 1991-92. MD 530F (Model 530F): Intended for hot-and-high operations and powered by a 650shp Allison 250-C30 derated to 425shp for take-off, the Model 530F was first flown on 22 October, 1982. The diameter of the main rotor was increased by 30.5cm and that of the tail rotor by 5cm. Loads of up to 907kg can be carried externally. On 30 August, 1984, an MD 530F flown by Steve Hanvey, MDHC manager of engineering flight test, set records for time to climb to 3,000 metres of 3 min 15 sec and time-to-climb to 6,000 metres of 6 min 34 sec in Class E1b (helicopters weighing between 500 and 1,000 kg) at Thermal, California. MD 530K: This version, which was certificated in August 1988, differed from the MD 530F in being fitted with the longer tail boom and larger main and tail rotors of the MD 520L. MD 530N: The MD 530N, the first production helicopter to be fitted with the NOTAR anti-torque system, uses the MD 530K airframe, is powered by the Allison 250-C30 derated to 425shp, and has twin vertical tail surfaces. A prototype (N530NT) was first flown on 29 December, 1989, and customer deliveries are to begin in 1991. Before entering service, the Cayuse demonstrated its performance and reliability when, without the need for a change of engine or major component, a single YOH-6A was used by five Army and two civil pilots to break or set 22 world records during flights from Edwards AFB in March and April 1966. Three of these records � distance in a closed circuit (2,800km), sustained altitude (8,061m); and speed over a 2,000km closed circuit (227.69km/h) � were for all classes of helicopters. Eight distance, speed, and time-to-height records were set in Class E1b (helicopters weighing between 500 and 1,000 kg) and 11 altitude, speed, and time-to-height records were established in Class E1c (helicopters weighing between 1,000 and 1,750 kg). A fourth all-class helicopter record was set on 7 April, 1966, when the same YOH-6A was flown solo by Hughes' test pilot Robert Ferry from Culver City, California, to Ormond Beach, Florida, a distance of 3,561km, nonstop in 15 hr 8 min. Entering service in September 1966, the OH-6A was quickly nicknamed "Loach", from its LOH role, and "egg", because of its fuselage shape. After a quick work up in the United States, OH-6As were rushed to Vietnam where in the summer of 1967 they replaced obsolete Bell OH-13s and Hiller OH-23s as the US Army's main type of scout helicopter. Flying in the observation role, acting as pathfinders for troop-carrying Hueys, and seeking targets for Cobra gunships, Loaches were more often than not fitted with a pilot-fired 7.62mm XM27E1 armament kit on the port side. Typically, two OH-6As were assigned to supplement UH-1s in Airmobile/Assault Helicopter Companies and CH-47s in Medium Helicopter/Assault Support Helicopter Companies while Armored Cavalry Squadrons had nine OH-6A scouts and nine AH-1G gunships. During the design phase close attention had been paid to combat survivability and occupant safety requirements. Hence, the Cayuse notably incorporated redundant, damage-tolerant components, and had ample power in reserve through the use of a derated engine. Nevertheless, combat and operational losses where high due to the type of missions flown. More than one out of five US helicopters lost during the Southeast Asia War was an OH-6A. Altogether, 635 Cayuses were shot down by AAA or small arms fire, 23 were destroyed on the ground during enemy attacks against their bases, and 297 were lost in operational accidents. Thus, as others were lost in accidents outside the war zone, fewer than 430 of the 1,420 production OH-6As remained in service when the Cayuses were withdrawn from Vietnam in March 1973. During the war, the OH-6A earned praise from flight crews and maintenance personnel alike as it was the most manoeuvrable and most easily maintained helicopter in the inventory. Nevertheless, as by the mid-seventies the Army had more OH-58As than OH-6As, the decision was made to withdraw OH-6As from active units and transfer them to Army National Guard units in 18 states and Puerto Rico. Fully satisfied with the operational record of its OH-6As, the Army National Guard will have 250 of its Cayuses brought up to OH-6B standard in the early 'nineties and plans to retain them in front line service well past the year 2000. Since withdrawn from service with active duty Army units, small numbers of OH-6As have been on loan to other government agencies such as the US Border Patrol, the Federal Bureau of Investigation, and NASA's Ames Research Center at Moffett Field, California, and Langley Research Center at Hampton, Virginia. With regular Army units, high-performance Hughes helicopters made a comeback in 1982 when MH-6B scouts and EH-6B SIGINT helicopters were delivered to the 160th Special Operations Aviation Group at Fort Campbell, Kentucky. Later supplemented by AH-6C/F/G light attack helicopters, MH-6E/F scouts, and EH-6E SIGINT platforms, these nimble and quiet helicopters have been used discreetly, but most effectively, in support of Special Forces and took part in operations in Grenada in 1983, the Persian Gulf in 1987-88, and Panama in 1989. Abroad, Hughes turbine-engined helicopters have been operated and in most instances continue to be operated by the air arms of the following nations: Argentina (RACA-assembled 500Ms and 500Ds, most now fitted with FLIR and night vision equipment, with I Escuadron de Exploration y Ataque, Fuerza Aerea Argentina, at Moron and RACA-assembled 500Ms on coast guard duty with the Prefectura Naval Argentina); Bahrain (500Ds with the Bahrain Public Security); Bolivia (500Ms with the Grupo de Operaciones Aereas Especiales, Fuerza Aerea Boliviana, at BAM Remore); Brazil (ex-USA OH-6As with the Centra de Instrucao de Helicopteros of the Force Aerea Brasileira at Santos, Sao Paulo); Colombia (500Fs, 500Ms and 500MD Defenders with the Grupo Aereo de Helicopteros and the Escuela de Helicopteros, Fuerza Aerea Colombiana, at BAM Melgar); Costa Rica (369s and 500Es with the Section Aerea, Ministerio de la Seguridad Publica); Denmark (500Ms with the Haerens Flyvetjaeneste/Army Air Service at Vandel); Dominican Republic (ex-USA OH-6As with the Escuadron de Helicopteros, Fuerza Aerea Dominicana); Finland (500Cs and 500Ds with the Helikopterilentue/Helicopter Flight, Ilmavoimat, at Hutti); Greece (BredaNardi 500s with the Helliniki Aeroporia at Dekelia); Haiti (500Cs with the Corps d'Aviation d'Haiti); Honduras (369Ds with the Fuerza Aerea Hondurena at BA Hernan Acosta Mejia in Tegucigalpa); Indonesia (500Cs with the Tentara Nasional Indonesia-Angkatan Udara); Iraq (500Ds and 500Fs sold for civil duties but believed taken over by Al Quwwat al Jawwiya al 'Iraqiya); Israel (500MD/TOW Defenders with the Heyl Ha'Avir); Italy (BredaNardi-built MD 500Es with the Scuola Volo Elicotteri, Aeronautica Militare Italiana, at Frosinone, and BredaNardi-built 500Ms, 500MCs, and 500MDs with the Servicio Aereo della Guardia di Finanze); Japan (Kawasaki-built OH-6Js and OH-6Ds with the Koki Gakko training center and 13 squadrons of the Nihon Rikujyo Jieitai/Japanese Ground Self-Defence Force, and Kawasaki-built OH-6Js and OH-6Ds with a training squadron of the Nihon Kaijyo Jieitai/Japanese Maritime Self-Defence Force); Jordan (500Ds with No 7 Squadron, Al Quwwat al Jawwiya al Malakiya al Urduniya, at Amman-King Abdullah); Kenya (500Ds, 5OOMs, 500MD/ TOWs, and 500MEs with the Kenya Air Force at Moi); Korea (Hughes-built and Korean Air-assembled 500MD Scout Defenders and MD-TOW Defenders with the ROKAF, the Republic of Korea Army, and the Republic of Korea Navy); Mauritania (500Ms with the Force Aerienne Islamique de Mauritanie); Morocco (500MD Defenders and MD/TOW Defenders with the Force Aerienne Royale Marocaine); Nicaragua (ex-USA OH-6As first with the Fuerza Aerea de Nicaragua and then the Fuerza Aerea Sandinista); Philippines (500Ds operated by the Philippine Air Force for the Philippine Army); El Salvador (500Ms with the Fuerza Aerea Salvadorea); Spain (369Ms, designated Z.13s, with Escuadrilla 006, Arma Aerea de la Armada Espanola, at El Ferrol and aboard destroyers and frigates); and Taiwan (500MD/ASWs with the Chinese Nationalist Navy and 500Ms with the Chinese Nationalist Marine Corps). Since first delivered to civil operators in 1966, over 2,500 Model 500s and MD 500s of various models built by Hughes, MDHC, and their licensees have operated on all continents. In addition to their more common use as executive transports, these helicopters have been employed frequently for law enforcement, training, geological survey, transport of precious metals, oil drilling and other mineral exploration projects, rescue (notably in 1987 when recently delivered MD 530Fs were used in Colombia to help victims of the eruption of the Nevado del Ruiz volcano), support for civil engineering and construction projects, crop spraying (with a market breakthrough being achieved in 1988 when MD 500Es replaced Soviet-built Kamov Ka-26s operated by the Hungarian Ministry of Agriculture), and battle against pests (such as during attempts by the World Health Organization, WHO, to control the African River Blindness in eleven West African nations). Designed to a US Army requirement of 1960 for a Light Observation Helicopter (LOH), the Hughes Model 369 was evaluated against submissions from Bell and Hiller under the designation HO-6 (later OH-6). The Hughes design was ordered into production, but after 1,434 had been delivered from a total requirement of some 4,000, the Hughes contract was terminated. This resulted from falling production and rising costs, an unfortunate situation, for the OH-6A Cayuse was a superb light helicopter which, flown by service and civilian pilots, set a series of international helicopter records. Accommodation is for a crew of two, with two folding seats in the rear cabin which, when folded, provide sufficient space on the floor for four fully-equipped troops or a worthwhile load of cargo. OH-6As began to enter US Army service in September 1966, all 1,434 being delivered by August 1970. The majority remain in service, the Cayuse being employed for a wide range of duties, including offensive operations when equipped with a kit which mounts a machine-gun or grenade-launcher on the port side of the fuselage. In January 1984, Hughes Helicopters became a subsidiary of the McDonnell Douglas Corporation and the Model 269/ 300 sold to Schweizer. Development of military and civil versions of the 500 continued but the improved Series 500E and 530F Lifter (optimised for load-carrying) are the current production aircraft, along with earlier Model 500Ds built under licence in Italy (by Agusta), Argentina (by RACA), Japan (by Kawasaki) and South Korea (by Korean Air). Following the construction and flight-testing of a NOTAR (NO TAil Rotor) testbed, certificated versions are now produced of the MD520N (a NOTAR MD500) and the MD530N (a NOTAR 530F) and output is already sold out to 1994. Also available are military versions of the 500 and 530 designated AH-6, MH-6, Nightfox and Defender. McDonnell Douglas' line of light helicopters, derived from the Hughes company's products, was acquired by Boeing as part of its purchase of the former company in August 1997. Having no part in the Boeing business strategy, all except the A�-64 Apache were offered for sale and in January 1999 it was announced that Netherlands-based holding company MD Helicopters, owned by the Rotterdam Dockyard Company, had been successful in its bid. MD now owns all production jigs and tooling for the MD 500, 530F, 520N, 600N and Explorer, as well as a licence to employ the NOTAR system in future helicopters (the technology remaining in Boeing ownership) and in August 2000 acquired the former Boeing facility at Falcon Field, Mesa, Arizona, and began a 6,975m2 expansion to include a spares warehouse, completion and delivery centre and customer training facility. PROGRAMME: Derived from Hughes OH-6A/civil Model 500 first flown in 1963; US certification 30 June 1964; earlier versions produced for military and civil (engineering designations 369H, 369HM, 369HS, 369HE and 369D) use. First flight MD 500E (N5294A) 28 January 1982; first flight MD 530F, 22 October 1982. CURRENT VERSIONS: MD 500E: Replaced MD 500D in production 1982; deliveries started following issue of Type Certificate on 15 December 1982; Rolls-Royce 250-C20R became optional replacement for standard 250-C20B in late 1988; window area of forward canopy increased in 1991 model. MD 500E introduced many cabin improvements including more space for front and rear seat occupants, lower bulkhead between front and rear seats, T tail and optional four-blade Quiet Knight tail rotor. MD 530F Lifter: Powered by Rolls-Royce 250-C30; transmission rating increased from 280kW to 317kW from 11 July 1985; diameter of main rotor increased by 0.3m and of tail rotor by 5cm; cargo hook kit for 907kg external load available; certified 29 July 1983; first delivery 20 January 1984. Upgraded drive system in 369FF, certified 11 July 1985. Detailed description applies to MD 500E and 530F, except where indicated. MD 500/530 Defender: No longer in production. MD 500N: Produced as MD 520N. CUSTOMERS: Some 4,663 OH-6/MD 500/530 series (excluding licensed manufacture) produced by late 2002. Recent customers for the MD 500E include the San Diego County, California, Sheriff's Department (one); Columbus, Ohio, Police Department (one); and an unnamed US operator (two), all delivered in the first half of 2000. The San Diego County Sheriff�s Department has two MD 530Fs. Eleven MD 500s and four MD 530s delivered in 2000, four MD 500Es in 2001 and five in 2002. The Police Departments of Mesa, Arizona, Columbus, Ohio, Wichita, Kansas, and Atlanta, Georgia; and the Xiongying Aero Club of Zhongshan, China, each took delivery of an MD 500E during 2002; the Metropolitan Police Department of Las Vegas, Nevada, has three MD 530Fs. Mesa fleet rose lo three in December 2002 while Oklahoma City's fleet simultaneously increased to two. COSTS: Typical MD 500E US$860,000; MD 530F US$1.1 million (2002). Direct operating cost: MD 500E US$211, MD 530F US$237 per hour (both 2002). DESIGN FEATURES: Fully articulated five-blade main rotor with blades retained by stack of laminated steel straps, blade aerofoil section NACA 015; blades can be folded after removing retention pins; two-blade tail rotor with optional X-pattern four-blade Quiet Knight tail rotor to reduce external noise; optional high-skid landing gear to protect tail rotor in rough country; protective skid on base of lower fin; narrow chord fin with high-set tailplane and endplate fins introduced with MD 500D. Main rotor rpm (500E/530F) 492/477 normal; main rotor tip speed 207 to 208m/s; tail rotor rpm, 2,933/2,848. FLYING CONTROLS: Plain mechanical without hydraulic boost. STRUCTURE: Airframe based on two A frames from rotor head to landing gear legs, enclosing rear-seat occupants; front-seat occupants protected within straight line joining rotor hub and forward tips of landing skids; engine mounted inclined in rear of fuselage pod, with access through clamshell doors; main rotor blades have extruded aluminium spar hot-bonded to wraparound aluminium skin; tail rotor blades have swaged tubular spar and metal skin. Thicker fuselage skins, to reduce surface rippling, introduced during 2001. LANDING GEAR: Tubular skids carried on oleo-pneumatic shock-absorbers. Utility floats, snow skis and emergency inflatable floats optional. POWERPLANT: MD500E: One 313kW Rolls-Royce 250-C20B or 335.5kW 250-C20R turboshaft, derated in both cases to 280kW for T-O (5 minutes); maximum continuous rating 261kW. MD 530F: One 485kW Rolls-Royce 250-C30 turboshaft, derated to 317kW up to 92km/h and 280kW above 92km/h and for maximum continuous power (MCP). MCP transmission rating 261kW; improved, heavy-duty transmission, rating 447kW, derated to 280kW optional on production aircraft or for retrofit from June 1995. Two interconnected bladder fuel tanks with combined usable capacity of 242 litres. Self-sealing fuel tank optional. Refuelling point on starboard side of fuselage. Auxiliary fuel system, with 79.5 litre internal tank, available optionally. Oil capacity 5.7 litres. Greater capacity internal fuel tanks also available. ACCOMODATION: Forward bench seat for pilot and two passengers, with two or four passengers, or two litter patients and one medical attendant, in rear portion of cabin. Pilot sits on left instead of normal right-hand seating. Low-back front seats and individual rear seats, with fabric or leather upholstery, optional. Baggage space, capacity 0.31m3, under and behind rear seat in five-seat form. Clear space for 1.2m3 of cargo or baggage with only three front seats in place. Two doors on each side. Interior soundproofing optional. SYSTEMS: Aero Engineering Corporation air conditioning system or Fargo pod-mounted air conditioner optional. AVIONICS (MD 500E): Optional avionics listed below. Comms: Dual Bendix/King KY 195 or Rockwell Collins VHF-251 transceivers; Bendix/King KT 76 or Rockwell Collins TDR-950 transponder; intercom system, headsets, microphones; and optional public address system. Flight: Dual Bendix/King KX 175 or Rockwell Collins VHF-251/231 nav receivers, latter with IND-350 nav indicator; Bendix/King KR 85 or Rockwell Collins ADF-650 ADF. Instrumentation: Basic VFR instruments and night flying lighting, attitude and directional gyros and rate of climb indicator. Mission: Optional, FLIR and 30 Mcd Spectrolab SX-16 Nightsun searchlight. EQUIPMENT: Optional equipment includes shatterproof glass, heating/demisting system, nylon mesh seats, dual controls, cargo hook, cargo racks, underfuselage cargo pod, heated pitot tube, extended landing gear, blade storage rack, litter kit, emergency inflatable floats and inflated utility floats. I started work for the Army Aviation program in 1954. After the H16 program was cancelled 1n 1956 I was assigned to the Light Observation Helicopters ( H13 & H23]. The Army took over the Engineering, Procurement and total operation for Army aircraft in about 1960. I was with the LOH Project Manager from the beginning. We were with the development of the OH4-OH5 and OH6, testing, Source Selection Board, contracting, and production of the Oh6A. A modification line was run at Sharp- Army Depot to add armor protection along with other additions in order not to delay the Hughes production line. Once off the Sharp line they were flown to Vietnam in C141 aircraft. I was also on the Source Selection Board where the OH58 was the winner based on a price competition. A large portion of my life went into these programs. You folks that maintained and operated these helicopters are the real heroes. I still have a lot of facts and info. in my head about events like Paris Airshow twice,23 worlds records, and Congressional Investigation. I will be 93 this week [July 2917], so don't delay too long to contact me. At least we own N58428. It's not for sale though, since it's one of the last choppers from Airwolf left in the world, besides the JetRanger. Wait, we own the Hughes 369D's that were in Airwolf, unless I'm mistaken, I think something's wrong here. We own the Hughes 369D's that you saw on Airwolf. Pretty cool, right? If you you want to buy one then you're more than welcome to contact us by email with the one listed above. Or, our phone number is 614-486-930 and our fax is 614-486-7531. Thank you. I am searching for flight training for the md500 series. I flew as a scout observer for the air cav in Viet-Nam and logged over 700 combat flight hours. I now want to fly and purchase this helicopter. Any recommendations for schooling? I needs information about Emergency Float of Helicopter Hughes 500MD. Can you advise that Company Homepage of Float. tenho interece de compra de um helicoptero mini 500 em bom estado usado. You cannot mistake the sound of one of these approaching from far away. to me this is my favorite multifunction clipper from the americans, easy to use, to maintain, chip, and also cute, nice to go a one day beach party and come back without a parking lot, just in your backyard,nice.good scout copter. Hello, I am trying to find the direct wet operating cost of the 0H 6A with the T63 A 700, minus the cost of inscuance, please feel free to email me with any help or info that you might have. flew the OH-6 as a Cavalry scout pilot in Vietnam. It had sports car like handling, but was unpredictable at the limits. Surprisingly, the flight characteristics differed a bit from ship to ship. The OH-6 I flew most often, "The Idaho Spud" was very like a Porsche while others were a bit smoother. About half of all Army Oh-6s crashed for one reason or another. Nevertheless, it was the most crash survivable aircraft in the inventory. Scout aircraft rarely carried troops, but the OH-6 was underpowered for that role. With the mini-gun mounted, it was good for both reconnaissance by fire and ground attack until bigger support was on target. Look at Triceracopter on the web. Friend made this sculpture with damaged OH6A Cayuse donated by Army for 1976 Bicentenniel project. Artist died three years ago. Need to know the exact specs on the metal alloy used in the rotor blades. Artist subtitle for the sculpture was "Hope for the Obsolescence of War.". Is that photo taken above Malibu? Does anyone know? Photo at top of Page. If there is anyone having problems finding a good Component overhaul shop for 500/600 series. Please contact us at 313-806-9437. We have many years experience and have learned a few thing about them that have been overlooked. Have any questions call the number. I am trying to locate a military version of this fine aircraft, that I could use as a flyable or static display to establish a living history of the role it played in Vietnam (when I flew them0. If anyone knows of any available OH-6s, having served in vietnam...regardless of condition, please contact me. Any donations to this non-profit organization would be greatly appreciated. Michigan. I'm looking for a list of all the private owners of the MD500. I'm looking for one of these birds, any of the series. Have tradable items from my company. This is my favorit helicopter, if you know where I can find an airframe for this helicopter let me know. thank you. Does anybody know if Israeli operated the 500MD Defender in Olive Drab instead of Sand Brown? Hello, the " Hughes OH-6 Cayuse" T it has presented to the aeronautical living room of Le Bourget (France) in 1965? When the first specimen it arrived to France? The mechanical design of this helicopter is from the genius Howard Hughes. There is no other like it in all the world of rotor flight. The proximity of genius to insanity sometimes gives a false view of the person. Mr. Hughes should be remembered for this masterpiece and not the personal problems. A great many people would have lost their lives in lesser machines were this one not designed by him. i own this helicopter and am looking for insurance. please give me the name and phone number of insurance companies that insure this MD 500 minie. thank u. My name is Michalis Papaioannou i am greek and i live in Greece and I am a businessman. As you already know Greece is a very popular country and especially at the summer period when thousands of tourists deluge our wonderful islands.Thanks to the increasing tourism we made a big progress concerning the extreme sports which are very demand such as: (hobby rc toys) engined ATVehicles, GO CART, BUGGIES and MOTO CROSS. Several years ago all the above became legal vehicles from the European Union after they passed all the proper mechanical and technical tests and after that they have plate numbers just like the common vehicles in order to get placed to the car shops and car rent spots for selling.The difference between the plain salesman and the exclusive representative is that the one gets a good income and the other gets a bigger income because not only he sells these products but he also provides to the customers with the consumable parts and all the necessary spares and the most important thing is that he made it in time and wherever place the customer needs to receive the spare he wants. Consequently, the relationship between the exclusive representative and the customer become more stable and long duration. I would like to inform you that i could write to you a lot but i have no intention to make you tired. I own a magnificent hall and my aim is to lay a foundation that with the professionalism, the experience and the right marketing to be able to represent your company's products and make the difference in order to be the only one that the public concerns and after they meet us they will prefer our products. 1 RC BUGGIES 1/5. RC FORMULA1 1/5. RC BIG BOATS .RC BIG HELICOPTER. RC BIG JET AIRPLANE. (TOYS). 2.CAR, JEEP, GO CART, ATV and BUGGIES (REAL VEHICLES). 4. GLIDERS and ENGINE BOATS (REAL VEHICLES). I have already built race courses for the rc buggies 1/5 and the rc formula1 1/5 rc big helicopter (toys) in order to organize european races very soon. The JEEP (real vehicles), ATV (real vehicles), GO CART (real vehicles) and the BUGGIES (real vehicles) for the time being they borrow race courses until i am able to built their own high standards race course. Concerning the sail boats and the engine boats it is forbidden from the law to have their own area. The Gliders and the Engine Airplanes don't have their own place but we can easily rent just like the other representatives. I have prepare something unique in Greece and i would like to be informed if you are interesting to become the exclusive representative of your products and what are you asking for. hola soy de chile trabajo como tripulante de md 530 y me gustaria saber mas sobre mi helicoptero si alguien lee este mail por fa dirijase a escribirme a mi mail y asi compartir mas informacion del md. I�m 49 years old and when Hughes 300 and 500 apeared in the commercial adds (even in Portugal wich was not a very developed market) I was a litle boy but I�ve imediatly fall in love with those marvelous heli�s. The 500 was the model in wich I could fly the first time on an helicopter(litle kid�s dream came true), and I couln�t believe how smooth it was. THE BEST COPTER EVER! (It�s a shame that Hugues was so "craisy"...). Fly in one and you�ll see what I mean... (and yes: I�ve already flown Jet Ranger, 300MD, R22, R44, AllouetteIII). The Hughes / MD 500 series of helicopters, from the little 369 Cayuse to the 530, is such a little, nimble machine. It weighs hardly anything and has as many as five blades! It has a cramped rear seating compartment but a large area of visibility and is a structurally strong aircraft. � For observation duties the US Army received 1,434 Cayuses from an originally planned 4,000. � The first service OH-6s were delivered to the US Army in September 1965. � Soldiers nicknamed the OH-6 'Loach' because of its LOH role designation. � Cayuse and Model 500 variants serve in Japan, where some are dubbed 'chisai baggu' (little bug). � In Vietnam damaged Cayuses numbered 420; many were returned to flying status. � McDonnell Douglas still produces civil helicopters inspired by the OH-6 design. � MD500s were built by RACA (Argentina), Breda Nardi (Italy), Korean Air and Kawasaki (Japan). � Hughes was taken over in 1984: Hughes 500s became MD500s in August 1985. � The 500 was the basis for NOTAR, the first helicopter sold without a tail rotor. � First flown in September 1966, the MD500 carries 240 Iitres of fuel compared to 231 Iitres in the military OH-6. � An MD500 has been used by NASA to perform tests in engine and rotor noise. � A military version of the 500D called the 500MD Defender has been sold widely. � The Hughes MD 500 Defender is an uprated version of the OH-6 airframe armed with TOW anti-tank missiles. � The Model 500C could carry up to seven passengers or 776kg of cargo. � The OH-6 was fitted with a new tail section and powerplant and became the MD 500. � Hughes also developed a five-bladed OH- 6 known as the 'quiet one' with a five-bladed main rotor.